Objective: Make your quarter into different levels of cups. The more difficult the cup level, the more drinks you give out. Supplies: 10 cups, a quarter and alcohol of choice. Directions: Place the empty cups in four levels on the table, in tree form, with the widest layer closest to the players (see diagram below). Each layer represents points: Layer 4 - 1 point, Layer 3 - 2 points, Layer 2 - 3 points, Layer 1 - 4 points. Players take turns attempting to make quarters into cups. If they make it into a cup, they flip it over (so it's not in play) and give the point value out as drinks to another other player. 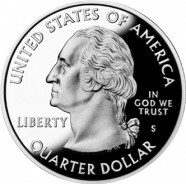 Pass the quarter to the next person whether you made it into the cup or not. User Ratings: 3.0 out of 5 by 5 users.